There's no denying it, Big Band Country really shows you who Nancy Hays is as a vocalist. It's all here—my love of swing and standards, a song I composed for my beloved father, the first song I ever sang for my husband, a long-time rodeo favorite for the UK fans, and much, much more. I hope you enjoy listening and dancing to these songs as much as I enjoy performing them. I hope you like getting to know the complete Nancy Hays. Thanks for listening! "Great traditional and modern country music, sung by a talented new vocalist guaranteed to bring you out to dance". Come Dance with Me is Nancy Hays most popular collection of country music originals. Nancy recorded it in Nashville backed by members of Ronnie Milsap’s band. 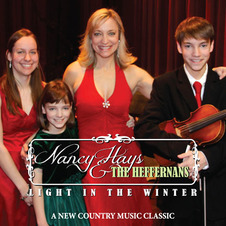 It contains Nancy’s international hit as well as the song “Dad” composed for her father and many other Nancy Hays favorites. "Come Dance with Me....performed by a lady with a voice that makes you feel you have known her for years. You want to sing along and then can't stop your feet tapping to the gentle Swing rhythmn. Jo Thompson put together a lovely beginner line dance of the same name that has taken off everywhere". Get in Line is the second country CD from Nancy Hays specifically designed for dance enthusiasts. The title track from Nancy's debut CD "Come Dance with Me" was a hit worldwide with dancers and was nominated twice for the Crystal Boot Award of "Best Beginner Dance of the Year" created by world famous choreographer, Jo Thompson. "Get in Line" contains two tracks choreographed by Jo, as well as nine other songs choreographed by other internationally recognized dancers including Max Perry, Barry and Dari Anne Amato, Michele Perron (Canada), John Robinson, Robbie McGowan Hickie (UK), Peter Metelnick and Alison Biggs (UK) and Doug and Jackie Miranda.